Over and over, people come here, seeking any number of things: land, security, riches, spiritual enlightenment. And then they leave. It is a tough land, where simple survival is difficult. Sometimes a well-prepared culture will come here and stay for a few centuries. Sometimes the sojourn is measured in decades. For us, it was two weeks. Does this sound like a condemnation of this landscape? It is most certainly not. 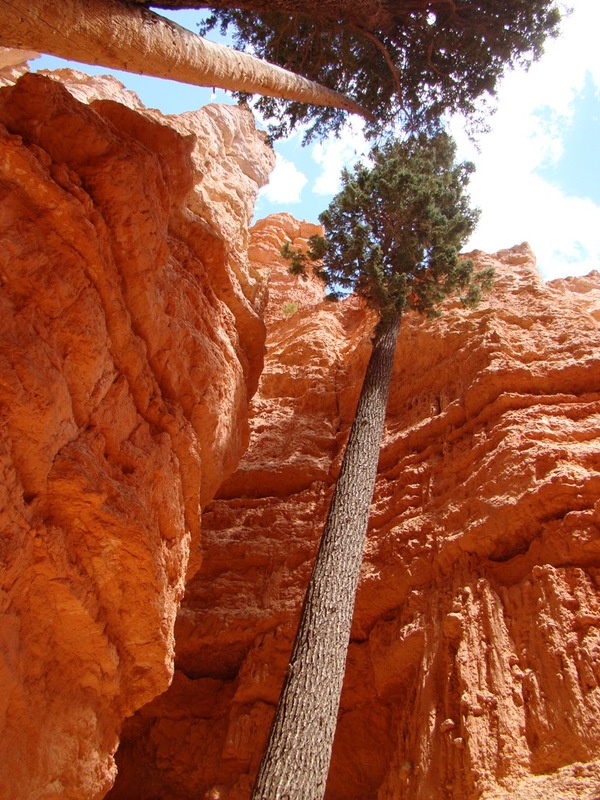 This land, the Colorado Plateau, encompassing parts of Arizona, Utah, Colorado, and New Mexico is most precious to me, a place I return to whenever I can. It is beautiful beyond words. It is a source of inspiration, and a fountain of information about the earth itself. But to visit this land, we must extend a bubble of our more comfortable environments, in little pods of slightly cooler air contained in vehicles that can transport us hundreds of miles where our forebears had to walk, or ride horses a few miles a day. There are towns and cities in this region today only because we bring energy and resources from elsewhere. This became apparent to me these last two weeks. 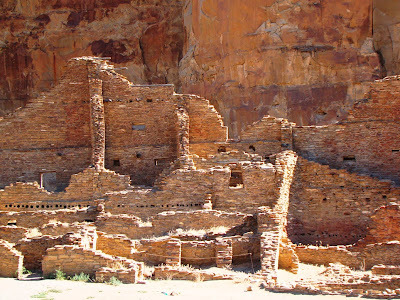 We had a wonderful journey, 30 students of geology and anthropology and their professors, on a trip that took us through the Grand Canyon, Petrified Forest, Mesa Verde, Chaco Canyon, Arches, Canyonlands, Zion, Bryce Canyon, and numerous other parks and monuments. As the trip continued, I was reminded over and over how ephemeral our existence is in a harsh landscape. 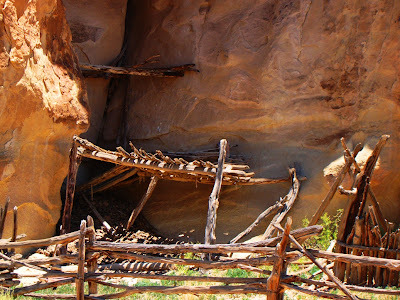 There were abandoned cliff dwellings, abandoned towns, abandoned railways, abandoned trails and roads. It is a place that sent people packing for other places when life became unsustainable. There are of course lessons here for our current civilization. 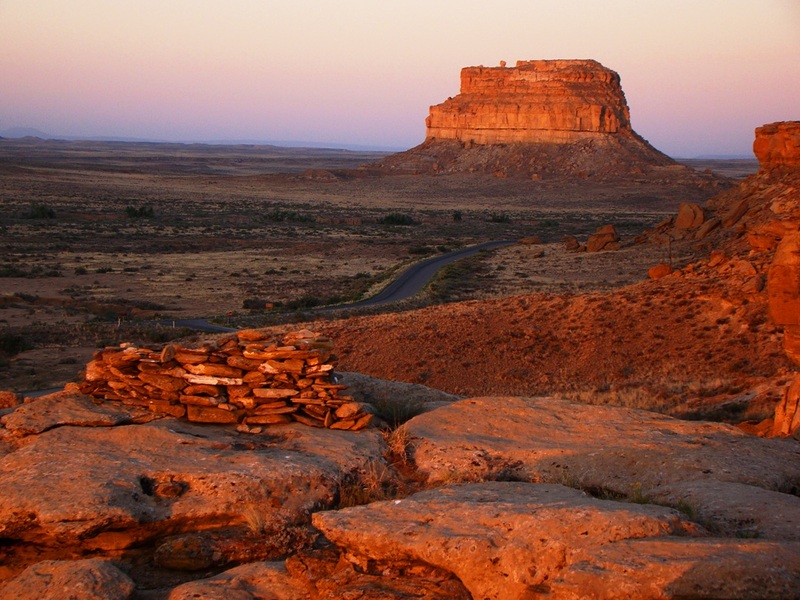 But mostly this land is beautiful, and reveals a rich history, of 13,000+ years of human occupation, and 2 billion years of geological history. For the next few weeks I will try to let you see this beautiful landscape the way we saw it. It has been abandoned over and over, but we are part of a society that occupies the land today, giving us access to a marvelous story. Another very brief bit of access to wifi in the back of beyond in Utah. 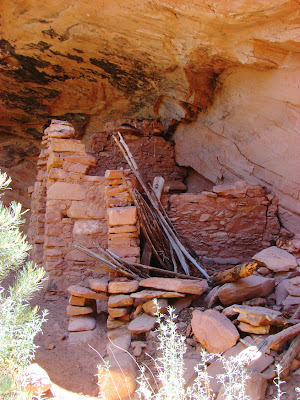 We're on day 15 of a 17 day trip across the Colorado Plateau, and I've had all of three opportunities to post anything. The fires out across the west are devastating, and we've seen them in the distance ever since we were in Colorado five days ago. 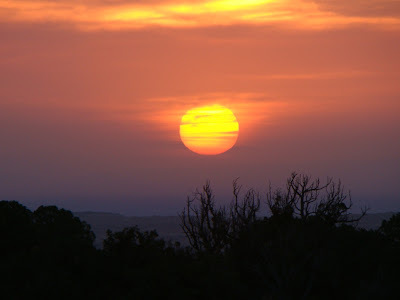 They have accompanied every sunrise and sunset since. 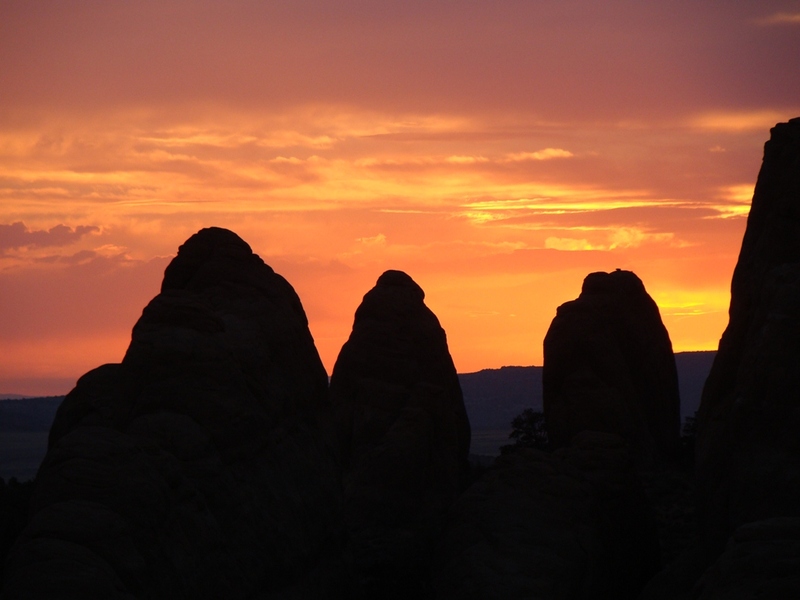 The first picture is sunrise from the Juniper Basin campsite at Arches National Park. 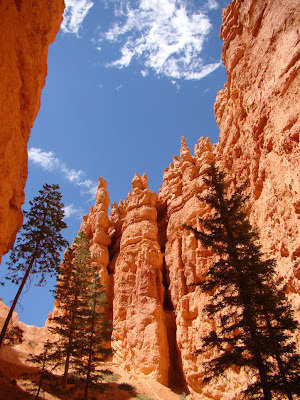 The third study in orange is fire captured in rock, in a sense, at Bryce Canyon National Park. I was on the Wall Street trail looking at one of my favorite sets of trees, the ones who've survived in this deep slot canyon among the hoodoos of the Paleocene-Eocene Claron Formation, one of the younger formations on the Colorado Plateau. Three long driving days, and we'll be home. I'm not expecting any wifi access, but who knows. 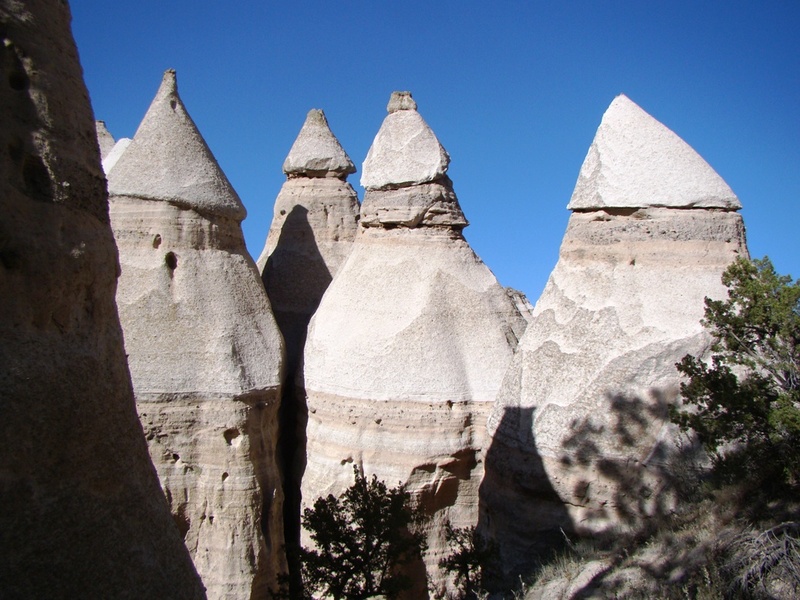 If you are wondering about the answer to the quiz in the previous post, Ron Schott got it, the Kasha-Katuwe Tent Rocks National Monument. 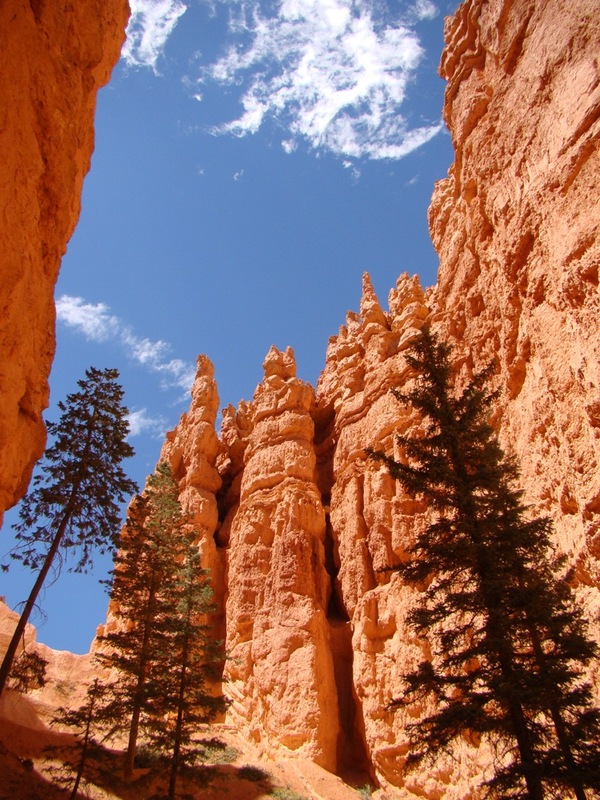 The rocks look much like those at Cappadocia, but they aren't as extensive, and no one is living in them! 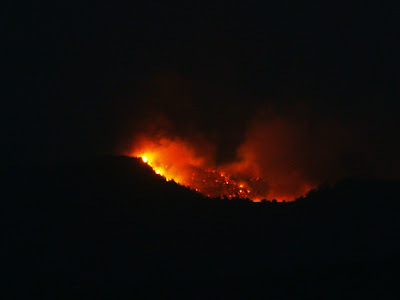 The fire was acting as a weather-maker. 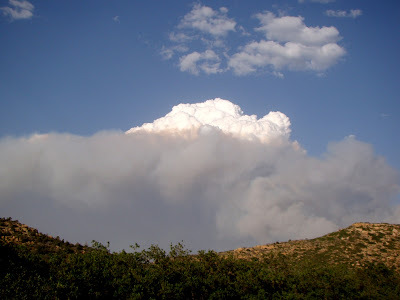 The hot mass of ash was causing updrafts that condensed into cumulus clouds. That's the white stuff over the gray ash clouds. Wifi is still rare out here...will update when I can! In the meantime, a pop quiz: where was this picture taken??? It's been very quiet at Geotripper, Inc. of late. We've been on the road with no wi-fi access or time at all. Many adventures have been had, and many more to come! Say hi to the bighorn sheep we met at the bottom of the Grand Canyon at Diamond Creek on the Hualapai Reservation. Hope all is well! More to come! 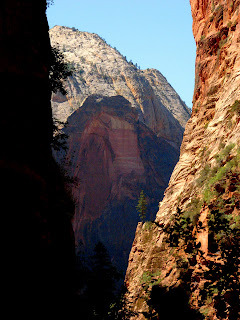 Edward Abbey talked about this wilderness as "Back of Beyond". 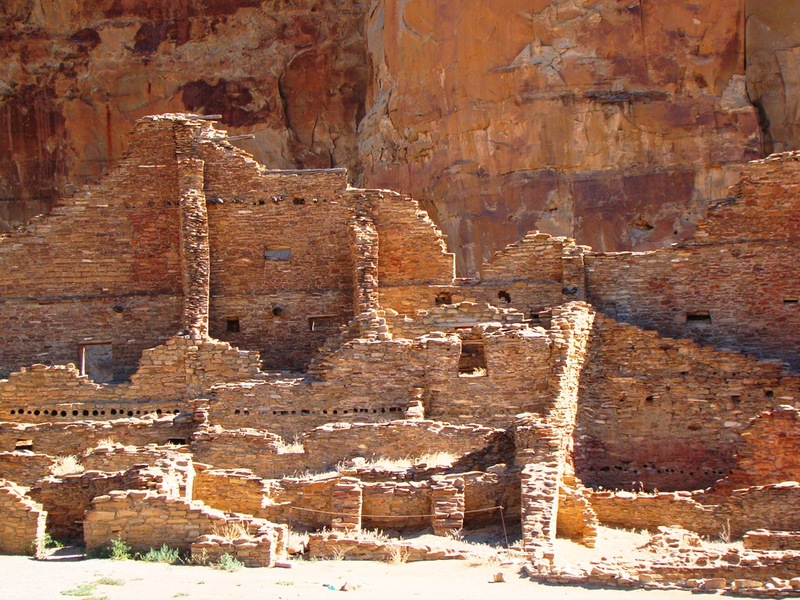 It is the Colorado Plateau, one of the most beautiful landscapes on our planet, and one of the greatest places to learn geology, and in our case, anthropology and archaeology as well. I'm headed there in the morning with 30 geology and anthropology students. We'll be on the road for a bit more than two weeks. I've been waiting all year for this moment. I have many favorite places in the world, but a huge number of them lie within the boundaries of this province. I'll be seeing some places I know fairly well, and a few places that I've never seen at all. Many of my students on this trip have never been out of California. I love my role as a teacher as they see this place for the first time. Many awesome sights and wonders. I know that "awesome" has become overused, but the word truly fits in this place. Needless to say, blogging may be hit and miss. 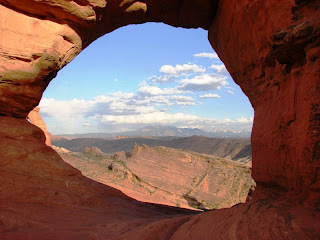 I'll try to post pics at the twitter account (@geotripper) and google plus (Garry Hayes) once in awhile too. 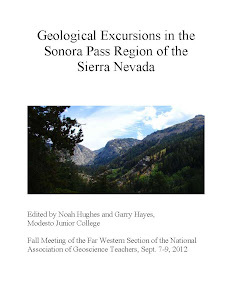 If you have ever wanted to spend a few days getting to know the geology and natural history of the Sierra Nevada, here is a great opportunity: the Fall 2012 meeting of the Far Western Section of the National Association of Geoscience Teachers. It will be held at the High Sierra Institute at Baker Station near the summit of Sonora Pass just north of Yosemite National Park. 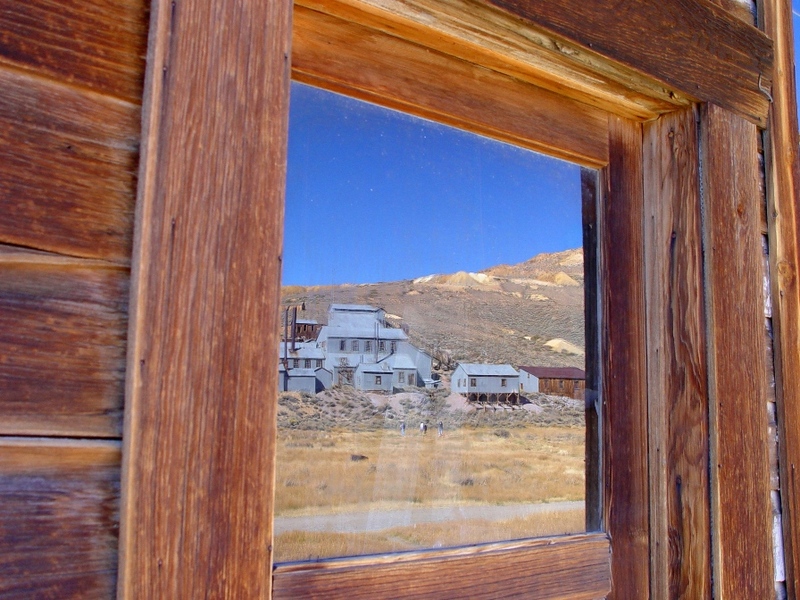 The High Sierra Institute at Baker Station is located in the center of some of the most fascinating geological features in California. From our base at the institute, we will be able to explore the record of volcanism in the High Sierra and the valleys to the east (including Mono Lake and the ghost town of Bodie), and the glaciation of the range from both sides of the Sierra Crest. 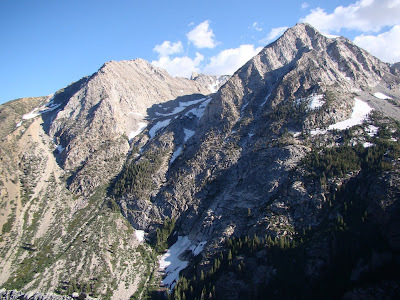 We will have access to plutonic and metamorphic rocks of the highest part of the Sierra near Tioga Pass, and the fascinating rocks of the Western Sierra Metamorphic Belt near Sonora and Columbia. This is a great opportunity for local earth science teachers to learn some interesting geology in their home region. Membership is not required to participate, but you will have an opportunity to join NAGT if you wish, and to purchase field guides and resources published by the Far Western Section. 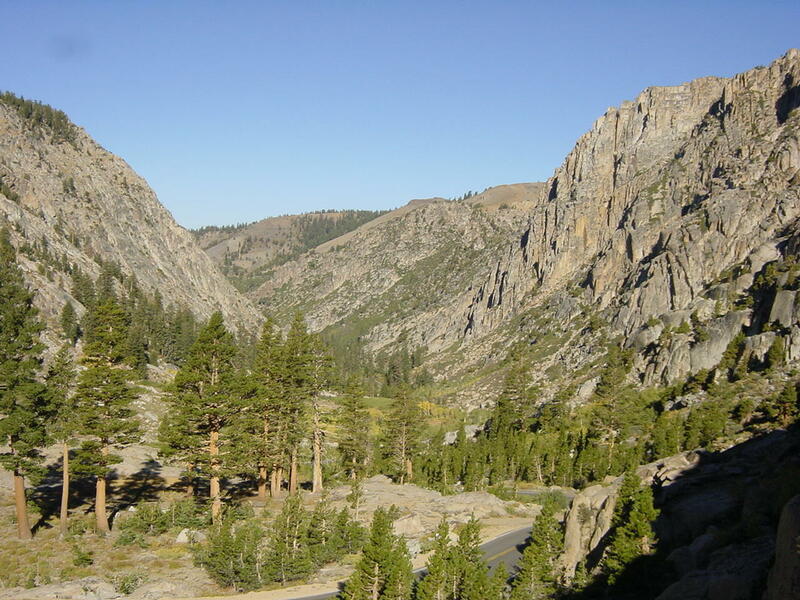 Sonora Pass reaches 9,623 feet and is the second highest paved highway in the Sierra Nevada. The scenery in the area is spectacular, and includes exposures of the granites of the Sierra Nevada batholith, a complex sequence of Neogene volcanic rocks, and a rich record of Pleistocene glacial activity. 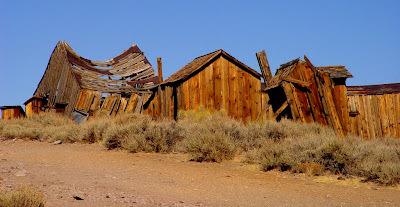 Some of our field trips will take us east of the crest of the Sierra, into the Bridgeport and Mono Lake Valleys. 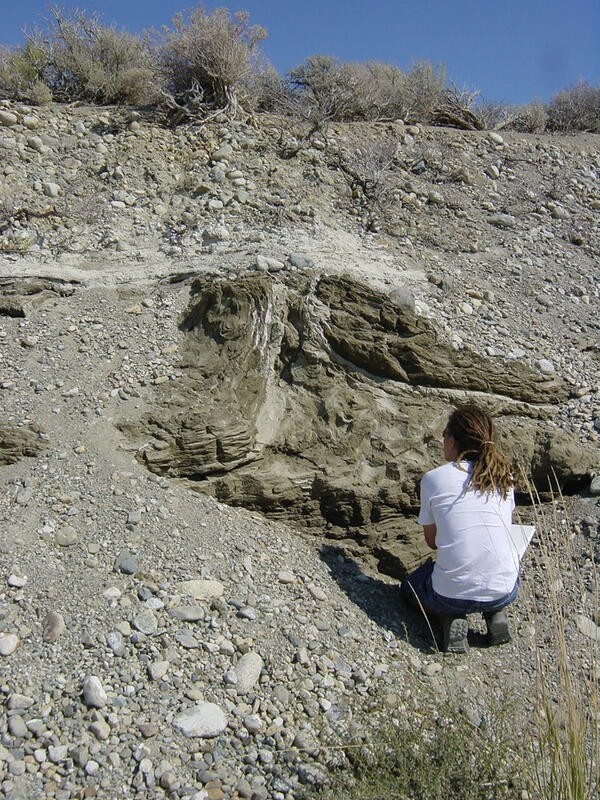 There is a rich record of Plio-Pleistocene volcanism and faulting to investigate, and some of the best glacial moraines to be found anywhere. Mono Lake is America's "Dead Sea", a vast alkaline lake with strange tufa towers and millions of migratory birds. We will have a chance to talk about environmental challenges at the lake caused by the diversion of incoming streams by Los Angeles. Trip 1: Walker Lane Belt Pull-apart Volcanism and the 11- 9 Ma Sierra Crest Graben at Sonora Pass: The one-day field trip will take place at Sonora Pass, in the newly-recognized 11- 9 Ma Sierra Crest Graben. Geologic highlights will include spectacular views of the Sierran crest, and in outcrop we will examine the Miocene graben fill. Basal deposits consist of giant landslide deposits, shed from Early Miocene arc volcanic sections on the graben shoulders. The landslide megablocks provide a smorgasbord of arc volcanic lithofacies, which we will identify in outcrop. The landslide megabreccia is overlain by by graben-ponded latite lava flows, which we will also study in outcrop. The trip will provide also overviews of the topographic evolution of the Sierra Nevada. Going up or going down? Evidence for late Cenozoic uplift of the Sierra Nevada, California, connection to tectonic and processes, and alternative explanations of paleoaltimetry. John Wakabayashi, Department of Earth and Environmental Sciences, California State University, Fresno. Call me deeply impressed. With two things really, the insight of the commenters who guessed at the identity of the Wednesday Whatsits, and with the City of St. George and its civic-minded citizens, both the landowner and the volunteers who have constructed a pretty incredible museum. In 2000, a local optometrist, Dr. Sheldon Johnson was trying to level a hilltop on his property in St. George. 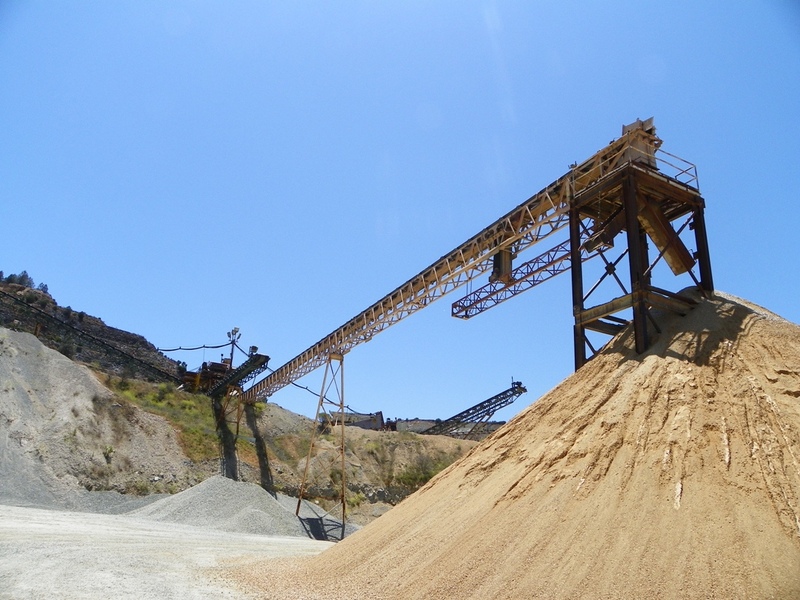 If you live in a place of thick soft soils and deeply weathered sediment, you should know that leveling a hilltop in the desert of southwest Utah is a challenging proposition, involving huge slabs of solid sandstone and heavy-duty equipment. As Dr. Sheldon overturned a big slab, he noticed strange indentations that he recognized as a dinosaur track. As more and more tracks were exposed, it was dawning on everyone concerned that this site was extraordinary. 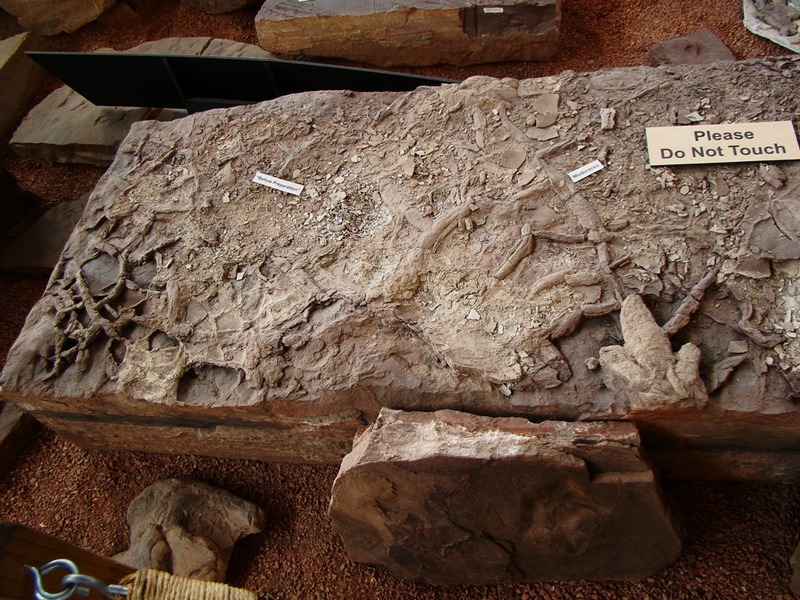 The Johnsons eventually worked with the city and other governmental entities to preserve the site, and the present Dinosaur Discovery at Johnson Farm Museum is the happy result. Did I say extraordinary? 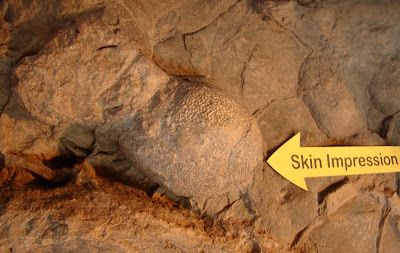 Aside from intact pathways of walking and running dinosaurs filling out much of the museum open space (above), some of the tracks are so well preserved that they display claw shapes and dinosaur skin impressions! 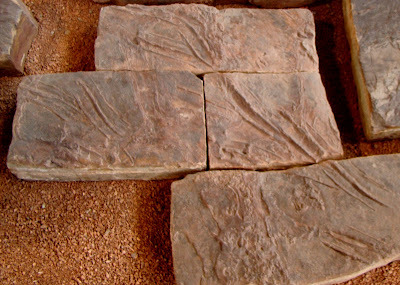 The curators have done a pretty incredible job preparing the slabs for research and display. The picture below shows the raw material they have to work with. The picture below shows a typical result, which was the first of the Wednesday Whatsits. 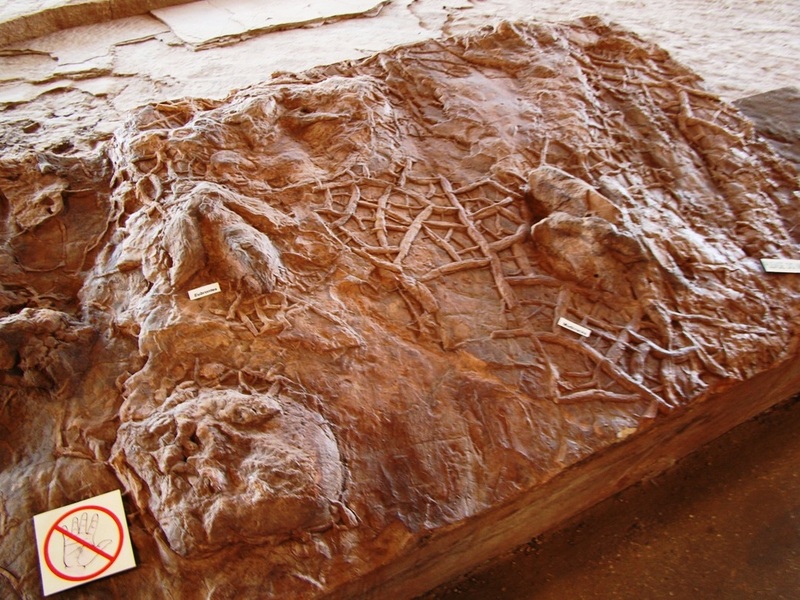 As several of you noted, it is a cast of mudcracks with a big dinosaur track at the center. An even bigger track can be seen at the left side. These rocks are part of the early Jurassic Whitmore Point and Dinosaur Canyon members of the Moenave formation, about 195-198 million years old. 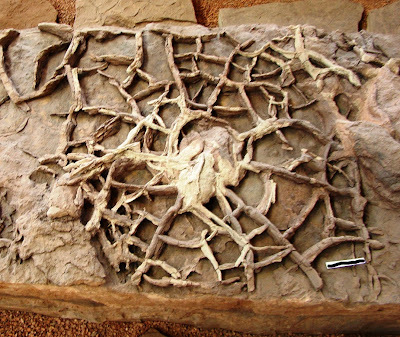 A lake covered the region, and dinosaurs haunted the margins. And some of them went fishing. 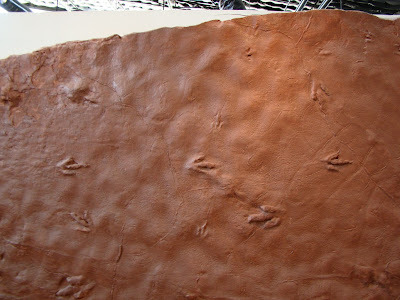 The second whatsit was a group of slabs with swimming marks made as the dinosaurs were stepping into deeper water and starting to float. These kinds of features are quite rare, as you might expect. I have to say that what impressed me most was the extra effort to educate museum visitors. 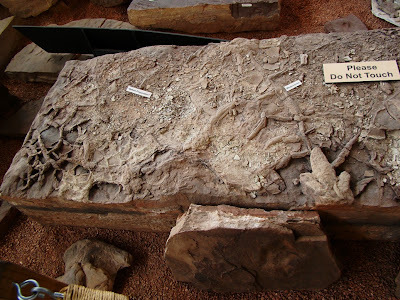 One has to admit that a staple of dinosaur exhibits involves giant replicas of dino skeletons posing in such a way as to suggest that they are ripping each other apart. 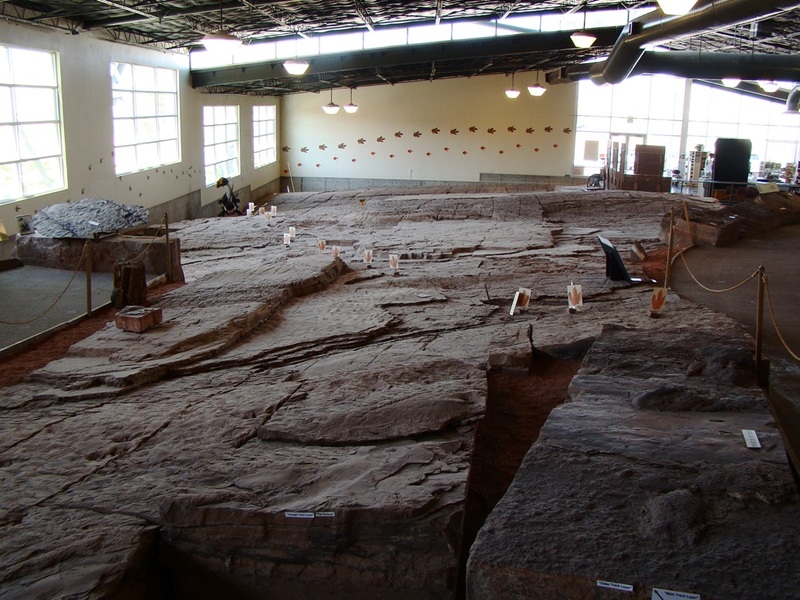 When is the last time you were in a dinosaur museum that actually emphasized the sedimentary structures and environmental indicators in the rocks? They devoted a lot of space to an explanation of rill marks, flute casts, load casts, and ripplemarks. And it was done well. A Wednesday Whatsit: What is it? A pair of puzzles for a Wednesday afternoon. What are these??? First prize is bragging rights! I'm really glad we had an eclipse two weeks ago. Otherwise I would not have had a sun filter in my camera bag today. 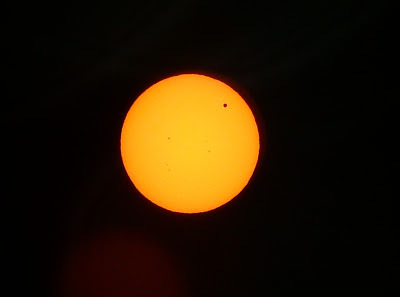 Venus is passing in front of the sun for only the second time this century (the last was in 2004, and the next will not be until 2117. You have until sundown to try and check it out, but don't look directly at the sun or expose your camera to the direct rays. There are ways to project the image on paper, too. You call that little bag of samples rock collecting? THIS is rock collecting! Had a short diversion out of a busy week a few days ago. I went rock collecting. But not just rock collecting. I went ROCK collecting. 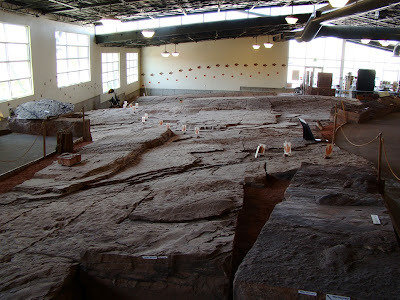 We're are in the final stages of completing our new Science Community Center (which will house the science programs and a big new Great Valley Museum) and it was our desire to have some landscaping around the building that reflected some of the unique rock types we have in our region. But the idea isn't to have a little chunk of rock laying on the ground. We intend to have a couple of ton-sized boulders. Choosing what type of rock is the trick. 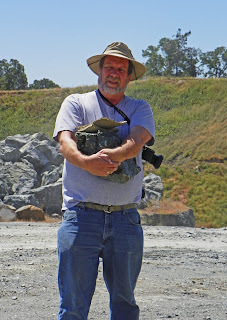 This is California; we have a great many geological environments, and many rock types could be described as "typical". We live next to the Sierra Nevada batholith, so a big chunk of granitic rock could be used. But that's kind of plain. We are in the Great Valley, so we could go with a big piece of sandstone or siltstone from the Great Valley Sequence, but such rocks are not very durable, and the rocks we choose may very well be in place fifty years from now. We decided to seek out two rocks that are found very close to our campus, in the Sierra Nevada foothills. The first is serpentine, the metamorphic product of bringing the Earth's mantle peridotite up through the crust under high pressure to the surface. 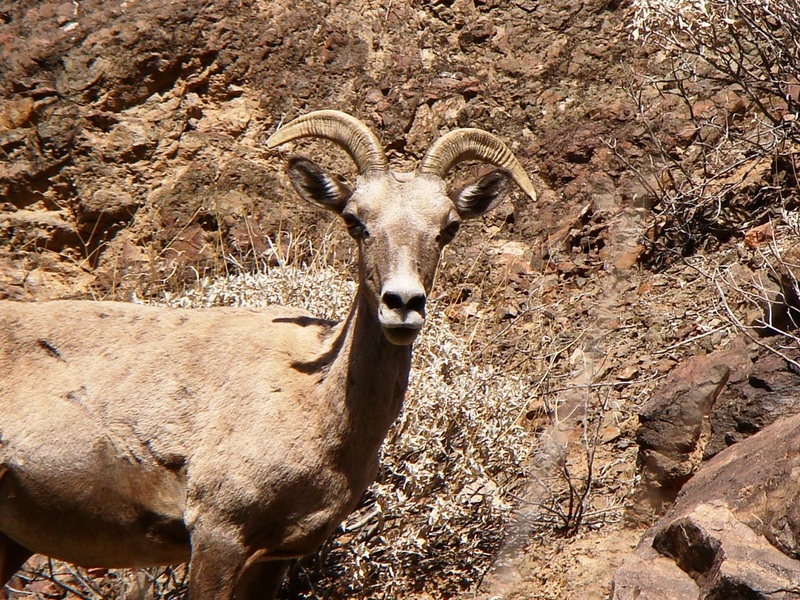 It is relatively rare in most places, but is common throughout much of California. It is unique enough that it was declared our state rock in the 1960s, joining our state mineral gold, and our state gemstone benitoite. The problem was finding an appropriate piece of the right size. There are lots of outcrops along the highway 49, but few active quarries. 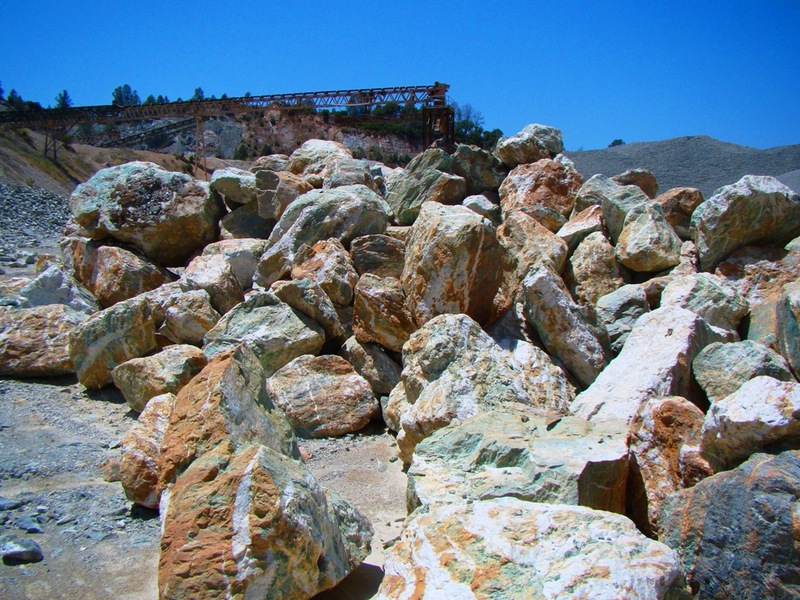 Serpentine was an important source of chromite, magnesite and mercury, but those ores are mostly imported these days. They were usually mined during wartime (WWI and WWII especially). 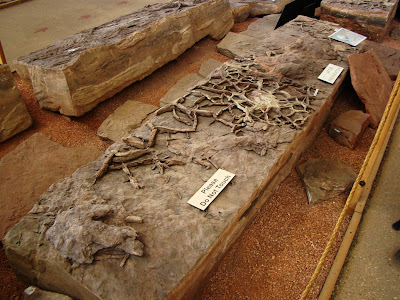 Serpentine was an important source of asbestos, which was a wonderful fireproofing material, but later it was also found to be a cause of lung cancer and mesothelioma. Asbestos became a scary material (all those lawyer commercials on late night TV may have clued you in to this), and serpentine is no longer mined for that purpose. We finally located a nearby quarry that was still active, grinding the material for road beds. 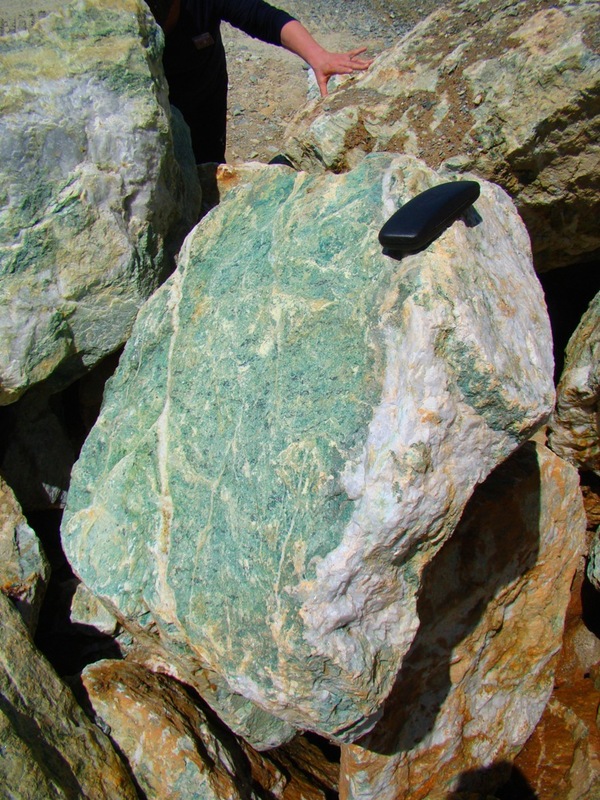 The other problem with serpentine is that on the journey from the depths of the mantle to the Earth's surface, the rock is internally sheared and fractured. It is not always durable enough. So we were invited to search the quarry for a good piece, one that could survive a bit of rough handling. Looking at the steep quarry face, and all the talus that has fallen from the edge, a possible candidate emerged. 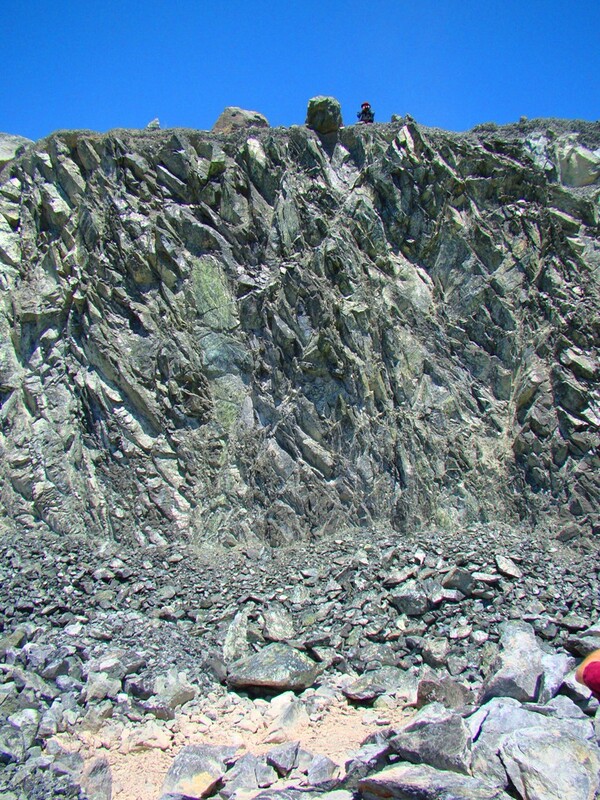 Look at the photo above (note Mrs. Geotripper up on the side of the quarry for scale): are there any chunks of rocks that have fallen and survived the impact? 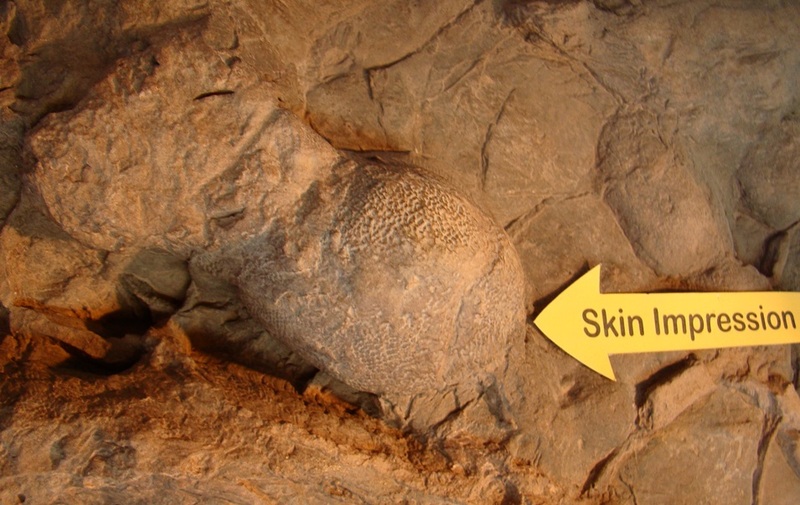 Yup, I saw it too, looking a bit like a turtle shell. Here it is up close (below). 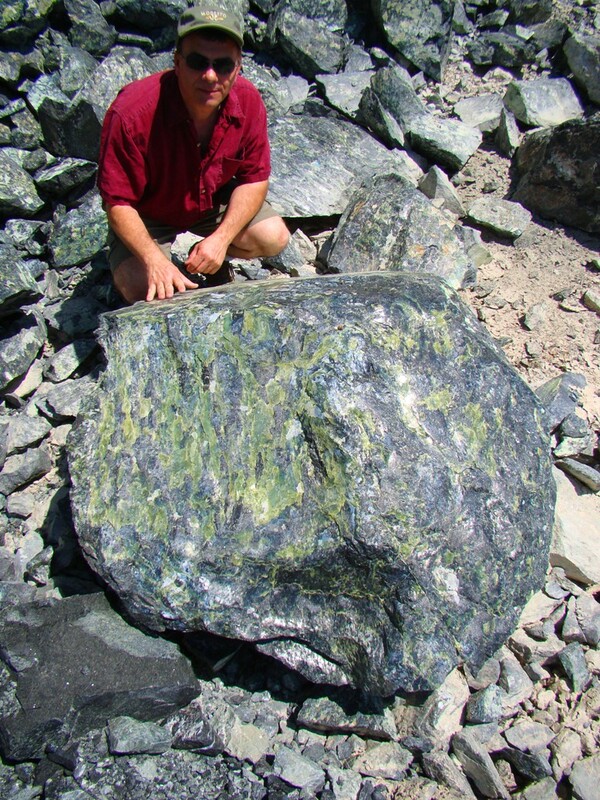 Not just a big chunk, but one that is covered with the beautiful polished green surfaces that resemble jade. 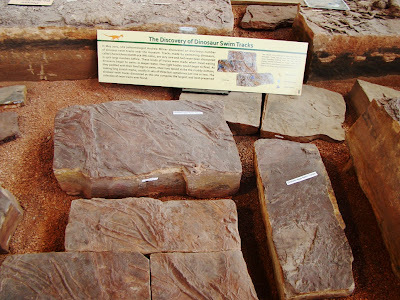 Just the perfect rock for school kids to touch when they are walking into the entrance of the museum. We discussed price with the quarry operators. "Oh, we sell by the ton. Say $30 per ton." Then we were off to the Carson Hill Mine Quarry to seek our next objective, a much rarer prize: A big piece of mariposite. 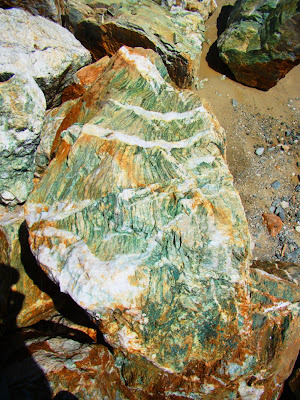 Mariposite is a mineral that is practically unique to our region (Mariposa is the Spanish word for "butterfly"; it is the name of the southernmost town in the Mother Lode). It is a chromium bearing mica that is somewhat related to fuschite, but the color is a very bright apple-green. It is often closely related to the gold-bearing quartz veins of the Mother Lode, and I have seen some beautiful samples that contain visible gold. It's a bit harder to find large samples, but the Carson Hill Mine, a Gold Rush era gold mine turned stone quarry, said they had some candidates we might like. And the other cool thing? 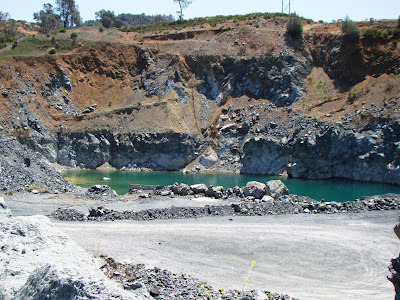 This is one of the quarries where the Mythbusters blow things up! I'm pretty sure that this is the spot where they blew up the cement truck, for instance. We pulled into the corner where they warehouse the big chunks of mariposite, and we started climbing over the boulder pile looking for the perfect sample. There was more in this one pile than I've ever seen anywhere else! How to choose? There was a day this home was abandoned. There was a day that something happened, a decision was made. Were they under attack? Did people die? Or was it a moment that a family knew the crops had failed, and there would be no food that winter? Or no more water in the nearby streambed? Were they called away to another place by a chief, or a shaman? Lots of questions, questions that are hard to answer. But abandoned it was, along with hundreds or thousands of similar homes in the region. 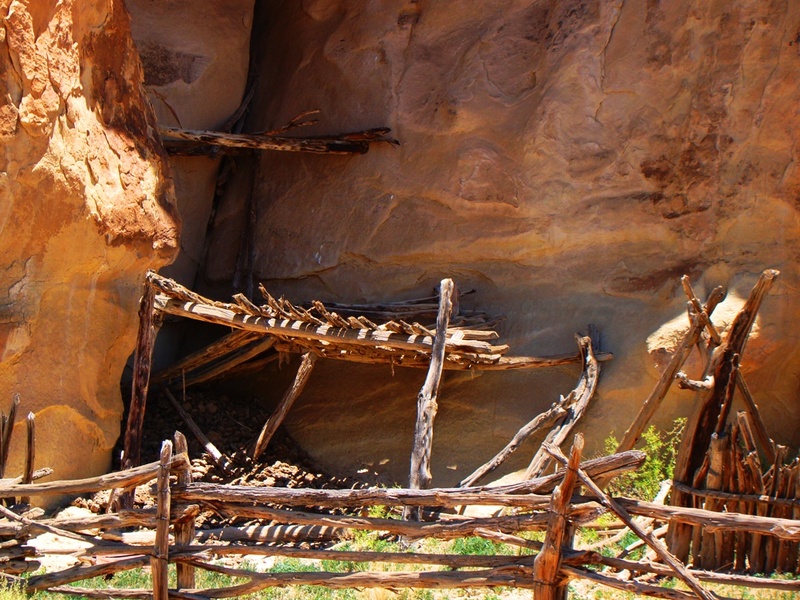 Abandoned for hundreds of years before others came into the region. 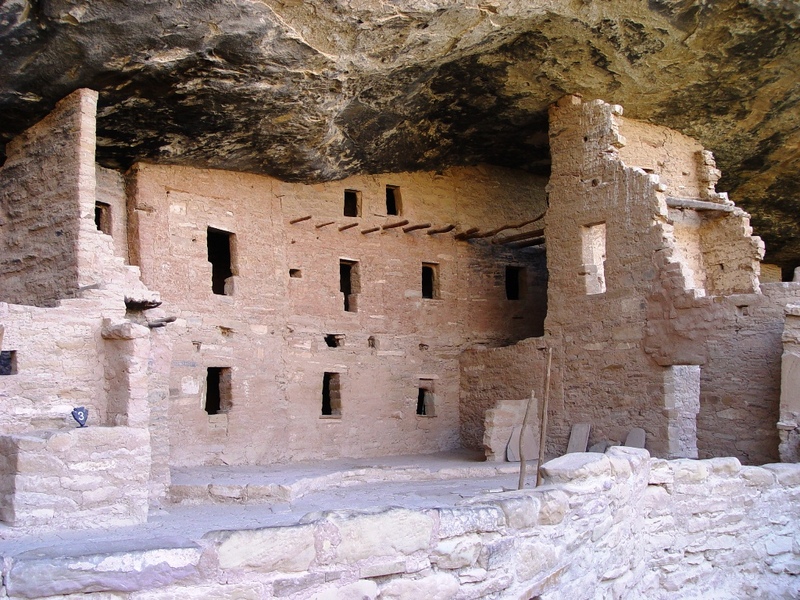 Tourists seek out these former homes, and many of them remark on the permanence of these structures, still standing after 800 years. I look at them and I think of the permanence of stone, maybe, but also the transitory existence of people and populations. 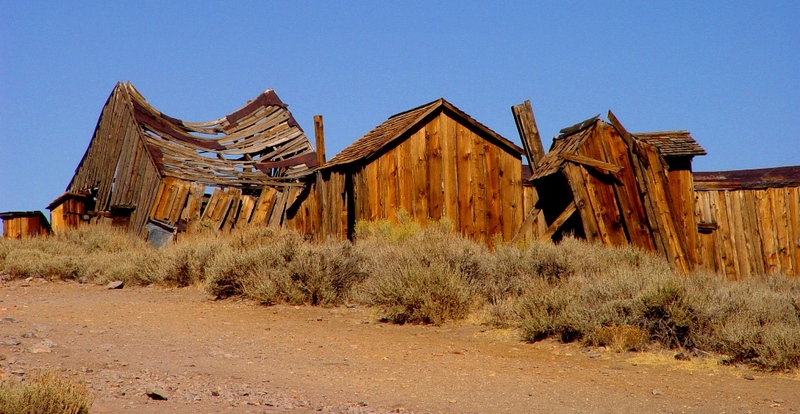 Before the decision to leave, generations of people had lived in these structures, and throughout their lives they never thought of being anywhere else. They didn't plan on enduring whatever catastrophe or threat that led to the decision to leave. But leave they did. There are lots of hypotheses, but I feel pretty strongly that they finally exceeded the capacity of the land to support human populations. That led to whatever else happened, I suspect. Accretionary Wedge #46, hosted this month by Knowledge Flocs asks the question: How has life or civilization been affected by geology or how has geology been affected by life? I pondered this question essentially for the whole month before sitting down tonight and writing this. I was out there on the Colorado Plateau a few weeks back, and I almost mindlessly snapped a picture that I didn't give a second thought to. It was part of the view from the Wahweap Overlook at Lake Powell on the border between Arizona and Utah, and I was snapping a series of shots to get sort of a panoramic record of the view. Tonight it caught my eye. A coal-burning power plant on the shores of an artificial desert lake. What is the carrying capacity of this land? There are thousands of people living in the immediate vicinity, but there are lines of copper wire leading out like a web to literally millions of homes in the wider region, especially places like Phoenix or Las Vegas. Looking at the coal-burning powerplant is to realize that the present-day population is depending on sunlight that fell on plants 70 million years ago to survive. They are depending on water that used to exist only in a deep inaccessible canyon. And to propel their vehicles they import the remains of plankton and one-celled organisms that lived by trillions upon trillions 200 million years ago in oceans and seas that don't even exist on Planet Earth anymore. Their food in large part is grown in other states or other continents. And we take for granted that we will be living here permanently. We barely ever give thought to the intricate web of connections and imported energy that keeps this civilization alive. 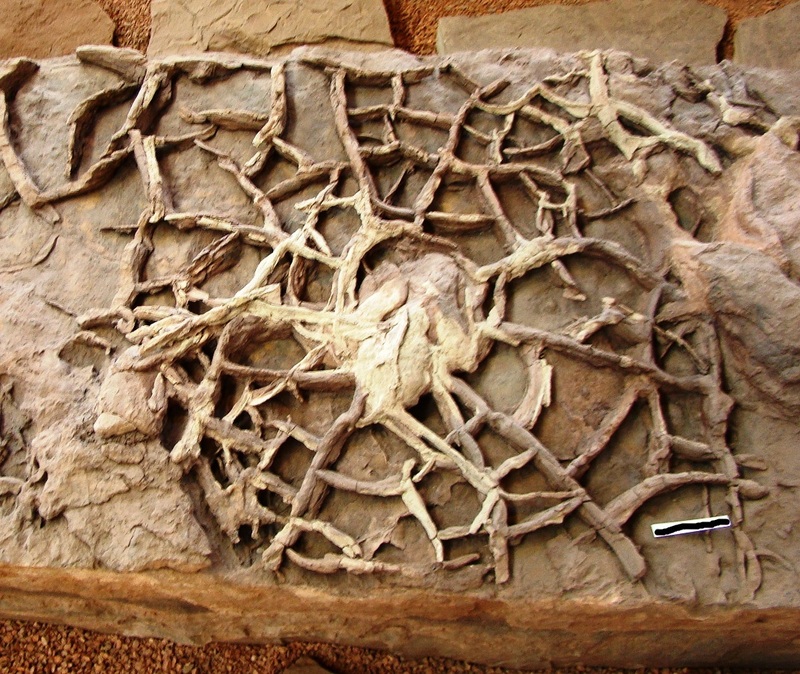 What happens when a piece of the web breaks? 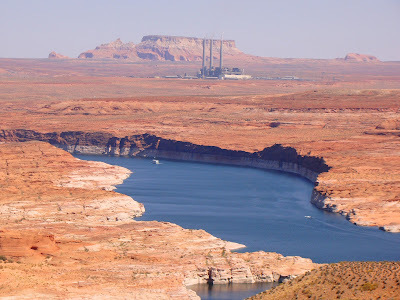 I ask in particular because of that white strip along the shoreline of Lake Powell. It's the bathtub ring of the reservoir. It doesn't look like much from my lofty perch, but that is a terrifying lake level if you are one of the watermasters responsible for providing an allotment of water needed to keep things going downstream. The Colorado is the most important source of water in this arid land except for groundwater, which is pretty much non-renewable and is being used up in many areas. The region has been suffering through a decade-long drought, and global warming is leading to changes that may intensify the droughts for the conceivable future. 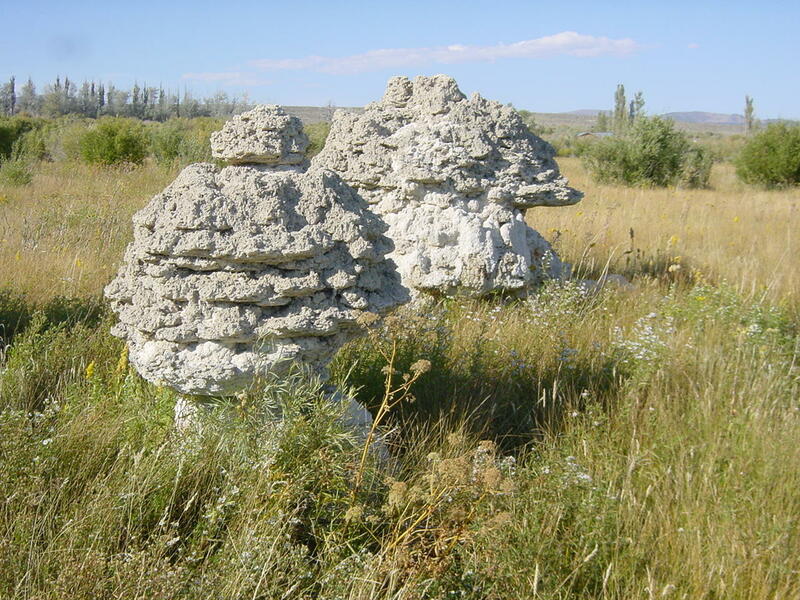 There are limits.That is the effect of geology on human life in this region. There is only so much water, and there is only so much coal. And populations and societies are not stable. Some will last longer than others, but the changes will come. Will we know when the limits have been reached and act? Or will we be caught off guard, and realize we need to move someplace else? And where will we go? I'm appalled when I hear politicians say that the most important questions facing our generation have to do with the marriage of the gays and how important it is to de-fund Planned Parenthood.